The Television Infrared Observation Satellite Program (TIROS) was NASA’s first experimental step to determine if satellites could be useful in the study of the Earth. At that time, the effectiveness of satellite observations was still unproven. Since satellites were a new technology, the TIROS Program also tested various design issues for spacecraft: instruments, data and operational parameters. The goal was to improve satellite applications for Earth-bound decisions, such as “should we evacuate the coast because of the hurricane?”. The TIROS Program’s first priority was the development of a meteorological satellite information system. Weather forecasting was deemed the most promising application of space-based observations. TIROS proved extremely successful, providing the first accurate weather forecasts based on data gathered from space. 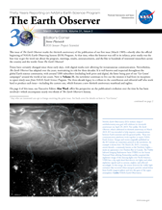 TIROS began continuous coverage of the Earth’s weather in 1962, and was used by meteorologists worldwide. The program’s success with many instrument types and orbital configurations led to the development of more sophisticated meteorological observation satellites. To test experimental television techniques designed to develop a worldwide meteorological satellite information system. To test Sun angle and horizon sensor systems for spacecraft orientation.